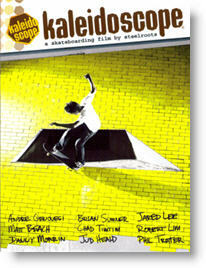 Steelroots, a provider of positive television for youth and young adults, today announced the release of its new skateboard DVD “Kaleidoscope.” Shot over a year in various locations across the world, the gritty, in-your-face video tells the story of nine skateboarders who have purposed in their hearts to make their faith known throughout the nations. Skateboarders featured in the video include: Andre Genouesi, Matt Beach, Danny Morrin, Brian Summer, Chad Timtim, Jud Heald, Jared Lee, Robert Lim, and Phil Trotter. The athletes stories of struggle and emerging faith are set to a backdrop of over-the-top skate tricks, interviews, and music by popular Christian and mainstream artists. A companion Kaleidoscope soundtrack and devotional are also available. The “Kaleidoscope” DVD and companion products are available nationwide in Family Christian, Mardel, Berean, and Hastings stores. The products can also be purchased online at steelroots.com. Since launching in 2000, Steelroots is one of the few ministries focusing on teenagers and young adults involved in action sports. Steelroots uses television, Internet, print media, products, and special events to accomplish its vision of revealing the truth to todays generation. Steelroots original television programs include its flagship ministry program Steelroots The Show, Steelroots Action Sports Show, SRtvs Top Ten Countdown, Mayhem, Mixx Masters Lounge, and special programs that address timely topics. SRtv-Steelroots television is broadcast to more than 88 million homes worldwide through INSP The Inspiration Network, Inspirational Life Television (i- Lifetv), and Inspiration Network International (INI). Steelroots line of action sports products includes DVDs, devotionals, magazines, clothing, and skate decks. Steelroots products are available at Christian retail locations, as well as through the online Steelroots Pro Shop at http://www.steelrootsproshop.com.